Very shortly, the U.S. Supreme Court will be composed primarily of judges who adhere to the extreme conservative views promoted for the past 30 years by Charles and David Koch. The two brothers are wealthy beyond measure thanks to their father’s willingness to collaborate with Josef Stalin and later Adolf Hitler. 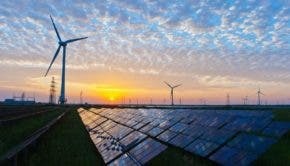 Perhaps at that point, we should start calling it the Koch Kourt of the United States, as 5 of its members will be card carrying members of the Federalist Society, and organization devoted to dismantling the New Deal, enslaving the poor, denying climate change, and raising corporations to the level of gods. Those Koch Klowns believe devoutly that the U.S. Constitution is a dead document frozen for all time in the year 1787. Which means they believe African Americans really should only be counted as 3/5 of a person and that women should not have the right to vote or participate in government in any way. The proof of the pudding is that the new conservative bloc will be all men — whether the next judge ends up begin Brett Kavanaugh or someone else. Paul Waldman, an op-ed contributor to the Washington Post, put it succinctly in a recent post. Why is this important? Because demographic research suggests an enormous shift in the population of the United States over the next 20 years as people flock to urban areas — which are mostly located in just 8 coastal US states. 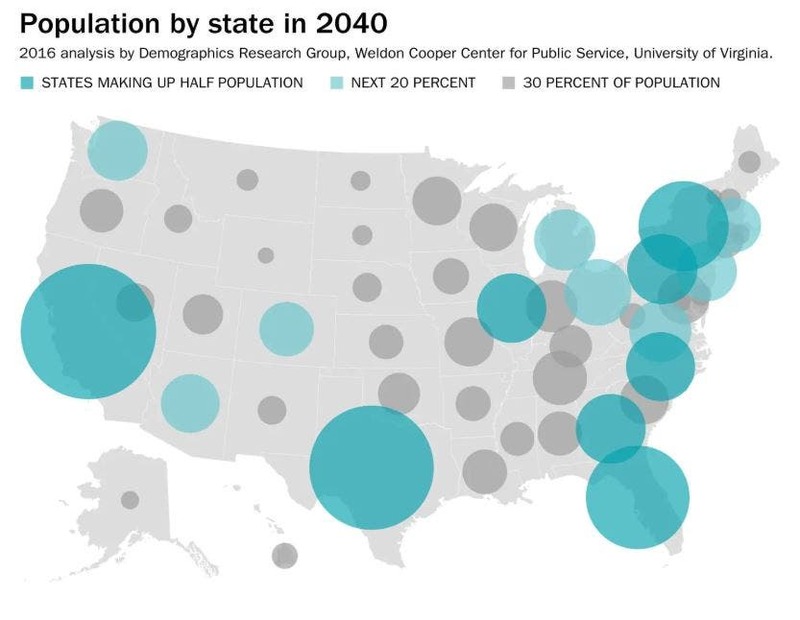 In 2016, the Weldon Cooper Center for Public Service of the University of Virginia analyzed projections made by the U.S. Census Bureau to estimate what the population of each state will be in 2040. According to a report in the Washington Post, it found that eight states will have almost half of the total population of the country. The next eight most populous states will account for an additional fifth of the population. That means the 16 most populous states will be home to about 70% of Americans but will have minority status in the US government. Under the US Constitution, each state has 2 senators, regardless of population. That means the two senators from Wyoming represent 580,000 Americans while the two senators from California represent 40 million citizens. Between the rules regarding the composition of the Senate and the Electoral College, the framers of the Constitution sought to guarantee that the smallest states in the new union would not be steamrollered by the biggest states. From that perspective, their plan worked perfectly. “In other words, our entire political system is built to give the Republican Party a series of advantages, even when they represent a minority of the public, as they now do,” Waldman adds. “In some cases that’s by their design, and in some cases it’s a happy accident, but it all points in the same direction. And when Republicans have power, they work ceaselessly to make the system even less democratic and more rigged in their favor.” And since Republicans are most likely to be in thrall to the Koch Brothers and their virulent campaign of climate denial, America will fail to address its obligation to its citizens and the rest of the world to limit carbon emissions and promote renewable energy as forcefully as it should be doing, given its self proclaimed leadership of the world community. The majority of Americans want their government to address climate change in a meaningful way, according to Gallup, but the majority of their representatives in Congress — and virtually all of the government minions appointed by Treasonous Trump — do not. This is not democracy in action, it is tyranny of the minority. It only takes a cursory glance at the chart above to see that America is being pulled apart as its people gravitate more and more toward coastal regions. Just as the tectonic shifts in Earth’s crust cause enormous upheavals, a political earthquake seems inevitable. As the old expression goes. “Be careful what you wish for, you just might get it.” Conservatives Reactionaries are hell bent on remaking America in their own image so their power will go unchallenged forever — sort of like the Thousand Year Reich — but history teaches us such dreams often end in failure after inflicting colossal damage on the societies they purport to support. “Power is a dangerous drug. It can maim; it can kill,” says Jimmy Buffett. The imperative to seize power is one of humanity’s most immutable traits, but those dreams often turn out to be merely chimeras, thanks to the Law of Unintended Consequences, which never takes a holiday. The hope is that America can transform itself into a functioning democracy soon but there seems little evidence of that happening. There is, however, an increasing likelihood that so-called conservatives will destroy that which they which they want most to possess. History has a way of playing vicious tricks on those who fly too close to the sun. America needs to be a leader in the global struggle to keep humans from destroying the Earth for profit, not an anchor holding back the process. That will require a government that represents the will of all the people, not that of a few powerful individuals and corporations. The Founding Fathers were terrified of pure democracy, which they equated with mob rule. But they never envisioned a system of government dominated by powerful corporations and individuals with the ability to buy influence on such a massive scale as is possible in America today. The anti-democratic policies incorporated into the Constitution have worked well to keep the passions of the populace from running wild, but left the door open for other forms of manipulation that have put the Republic at risk of grave harm. While the Supreme Court is busy parsing the purity of language written 250 years ago, it is oblivious to dangers presented by current trends that the Framers could never have possibly imagined. The United States has always prided itself on its ability to have an orderly transfer of power from one election cycle to the next. That aspect of government may soon be imperiled as more and more Americans come to realize their leaders do not represent them but rather a cabal of special interests and corporations dedicated solely to their own enrichment.